Delicious and healthy 100% complete dog food for 100% joyful mealtimes. 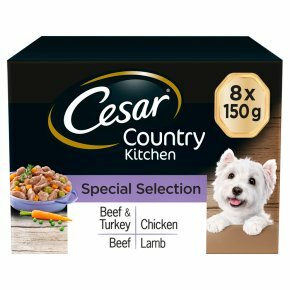 CESAR® Country kitchen is a range of rustic and hearty dog food dishes with a lovely homemade feel. 150g dog food tray with chunks in gravy and vegetables, seasoned with herbs and a delicious sauce. Quality pet food made with carefully selected ingredients. Delicious dog food recipes made with no added sugars, no artificial colours or flavour.A range of rustic and hearty dishes with a lovingly homemade feel. Seasoned with herbs and a delicious sauce, they will turn his mealtimes into moments of joy for him? and for you. And because all CESAR® recipes are healthy and 100% complete, your dog can enjoy them as often as you like. 24h Daily Feeding Recommendation Tray Only: 5kg 2 1/2, 7kg 3, 10kg 4 Tray + Dry Food: 1 + 50g, 1 1/2 + 55g, 1 1/2 + 85g We recommend to feed a mix of wet and dry food. 91 kcal / 100g Feeding instructions: Allow a transition phase and adjust amounts according to your pet's needs. For overweight dogs reduce daily amount. For more information on feeding your dog, please contact our Consumer Careline. Fresh water should always be available. Serve food at room temperature.